BtoB Peniel‘s second photography exhibition is currently open to the public in Seoul. 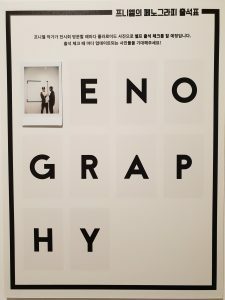 The exhibition, entitled “Second Penography”, will have photographs on display from BtoB’s promotions in Seoul, Tokyo and California. 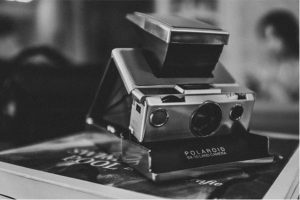 This latest foray follows his debut photography exhibition back in March 2017 which was received well by critics and was a hit with fans, selling out of merchandise within days of its launch. Idols are multi-talented creatures. As trainees, they are taught rigorously from an early age to sing and dance in order to have the chance to debut. Many groups will also have designated positions for idols, such as main/lead vocalists and dancers, ensuring a complementary mix of abilities in an idol group which play to each individual’s strengths. Idols will almost certainly dedicate the majority of their time to perfecting these skills and their punishing schedules will often leave little time to explore further talents. However, there are a number of ways that agencies have sought to expand their idols’ portfolios; most commonly these include acting, MCing, or variety stints. A number of idols have been incredibly successful in making their mark in these areas. Popular girl group members Suzy (formerly of Miss A) and Apink’s Jung Eunji have received accolades for their K-drama roles. Shinee’s Minho has also shown his versatility by expanding out into both film and dramas. 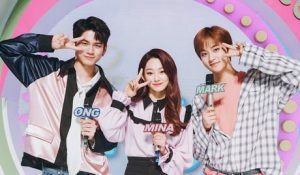 Meanwhile, Super Junior’s Heechul, Exid’s Hani, GOT7’s Jackson and Wanna One’s Ong Sungwoo have maximised their talents, making an impression in the variety field as well as completing successful MCing stints on weekly music shows – a common route for idols to expand their repertoire. Beyond these tried-and-tested avenues, there’s often limited scope for idols to explore their talents more formally. Nonetheless, some idols have often found a way to circumvent that by exploring hobbies that they are particularly talented in. Like Peniel’s photography exhibition, these artists and their agencies have found constructive ways to showcase some of their wider talents and expand their artistic horizons. BTS Jungkook’s self-initiated video production hobby is one that is particularly popular with fans. Through G.C.F (which stands for Golden Closet Films), Jungkook produces, directs and edits his own short films. Like Peniel’s photography subject, Jungkook’s videos usually focus on BTS’s travel as part of the group’s schedule, taking the form of a travel vlog. These audio-visual projects give fans a unique insight into the world of their idols, allowing them to see life through the idol’s eyes. By removing the middleman of media outlets, this medium offers fans direct access to idols’ lives, allowing them to feel like they are “journeying” alongside their idols and seeing the world from their perspective. Seeing not just the promotions, which is covered heavily by conventional media outlets, but the glimpses into the idols’ daily lives and first-hand at that helps to enhance the intimate relationship between idol and fan. 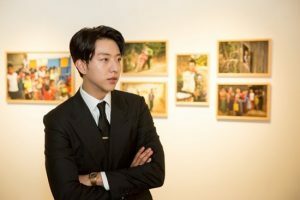 Peniel is not the only K-pop artist who has ventured into the photography realm: CNBlue Lee Jung Shin’s photography exhibition was unveiled earlier this year. The exhibition, titled “We blew away dandelion puffs”, explored the lives of underprivileged Burmese children, shining a light on their lives and the unfortunate conditions they lived in. The photography project was an extension of a charitable initiative by LOVE FNC Foundation, the corporate social responsibility arm of CNBlue’s record label FNC Entertainment. Lee’s photography captured LOVE FNC Foundation’s visit to the school and daycare centre that the agency sponsored and proceeds from sales of the photographs went towards funding scholarships in Myanmar. Lee has previously used his skills for charitable purposes by donating his photos to The Big Issue, a global magazine devoted to increasing awareness of homelessness. These projects enabled Lee to not only explore and showcase his own talents but to also contribute to a good cause at the same time. More importantly for FNC, the photo exhibition helped promote the agency’s own charitable and CSR initiatives whilst also doubling up as new content for fan consumption in a fresh and innovative way. BigHit Entertainment has also invested in G.C.F, with Jungkook going from editing videos in a closet (hence the name) to being given his own studio in which to produce material for the project . 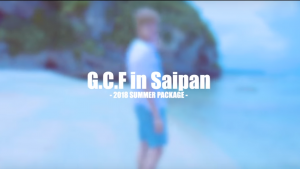 The agency clearly understands the importance of content creation, and particularly the value of organic mediums like G.C.F that resonate with fans. Beyond the audio-visual, there have been some forays into the more artistic side of the creative industry. 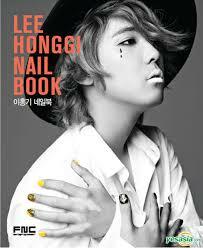 FT Island’s Lee Hong Ki is known for his interest in nail art, having confessed to spending huge sums on his obsession. Lee took his hobby public in 2013 releasing a limited edition 144-page nail art book. The book set out his nail art stories and insights, providing tips and designs for readers. A nail art kit and DVD accompanied the book which showed behind-the-scenes of the publishing process. The package gave fans the opportunity to actively partake in their idol’s personal hobby and feel a part of the process. Meanwhile, VIXX’s N has indulged in his candle-making skills, sharing his love for the hobby with fans during promotional events. In 2017, he hand-made over 600 candles to sell to Starlights, VIXX’s fandom, in celebration of his birthday. The proceeds from the sale of the candles was donated to victims of the Great East Japan Earthquake. These more fun and creative forays give fans the chance to see and support their idols indulging personal interests away from the more generic and restrictive group activities. Fans are often fully supportive of steps that idols take to relieve the stress that comes with their job. Most importantly, these hobbies allow fans to interact with artists on a more personal level – with the idols as individuals rather than their stage personas. As explored above, for agencies these hobbies provide more marketable talents that can increase fan engagement using innovative and untapped mediums. Many of these hobbies are promoted as complementary fan service: Jungkook’s videos are free to “consume”. However, irrespective of the idols at the centre of these projects, for agencies sometimes there’s a useful profit angle: whether monetary (as in Lee Hongki’s case) or reputational (as in Lee Jung Shin or N’s case) as a result of the charitable context. In addition, the more versatile the idol the better the returns for the agency on their investment in these idols. By encouraging the development of particular hobbies or forays into different industries, agencies of boy groups in particular are effectively cushioning the blow that accompanies compulsory military service. When promotions as a complete group are infeasible because of members’ enlistments, the agency is better positioned to continue promoting remaining members if they excel in other areas. With the tightening of legislation on military enlistment, we could see agencies encouraging more similar ventures in future. Caffeinated Londoner with a multi-fandom heart (ELF, Melody, Army, Shawol, and Wannable). I love K-drama and K-pop with a passion, as well as learning Korean and country-hopping around Asia when I have time to spare!